The abandoned amusement park of your childhood memories is where I decided to stop one day. ”Drove my Chevy to the levee but the levee was dry” were the lyrics I was singing on my way to the long rotting carcass that was once the local amusement venue known as “The Playground of Northeastern Pennsylvania “. A hollowness hung in the air as I pulled up to the field primarily containing weeds and busted up concrete, where the remains of Northeast PA memories of happier times lay abandoned, desolate and for the most part, dejected. How the residents loved Angela Park! Just read any number of the accounts by local historians and reporters to learn the facts about the rise and decline of this once popular roadside attraction that reads like a sadly typical American eulogy to lost community, prosperity, and small town life. I’m not really concerned about our agreed upon history about this specific park. I feel that way about many of the places I explore, much to the bewilderment of many local history buffs. I’m always interested in something different than facts about a long gone past. I’m concerned about the history of “just yesterday” and “now”. I think that we often forget that history evolves, and while we can’t change the past, we can choose how to shape our present and future history. History is a verb, or it can be if we choose to make it into one. And how we choose to interpret events as they occur, often tells us unspoken truths about ourselves and society at that moment in time, if we care enough to listen. Standing at the park entrance, I longed to hear the clatter of the wooden roller coaster followed by happy shrieks as the cars crest and swoosh. I would have loved to see the electric sparkle on the ceiling of the bumper car pavilion and to catch a whiff of the mixture of greasy French fries, cotton candy, diesel fuel, and chlorine in the air. That’s the stuff memories are made of! I could still smell that scent of pine that you would experience every time you rode the train near the picnic grove. But as far as I could tell, that was the only recognizable trait left from my memory of Angela Park since the burning charcoal and the picnickers left long ago. I’ve visited abandoned places to photograph them before, but none that had been a part of my childhood experience. It really mattered to me that I’d been there to ride the Tilt-A-Whirl and Carousel. I have fond memories of what seemed like a cutting edge arcade during the pre—Wii and XBOX era. Angela Park was a fun place to spend a day with family or friends that we all had easy access to, back when we had a real sense of shared community. During those times, small towns across the nation had local amusement parks to go to during a simpler era when even the annual broadcasts of the Wizard of Oz or Willie Wonka & the Chocolate Factory were popular shared cultural events among millions of households with children. As I stand there and look out at this amusement park from my childhood memories, it looks back at me, all neglected and ugly. Being there felt unsettling because all I could see was what wasn’t there anymore. Then I realized that this place still had life. Maybe not necessarily pleasant signs of life—but life just the same. It was hard to tell if that rustle in the weeds was a snake, a rat, or maybe a cute little bunny retreating as I moved closer. 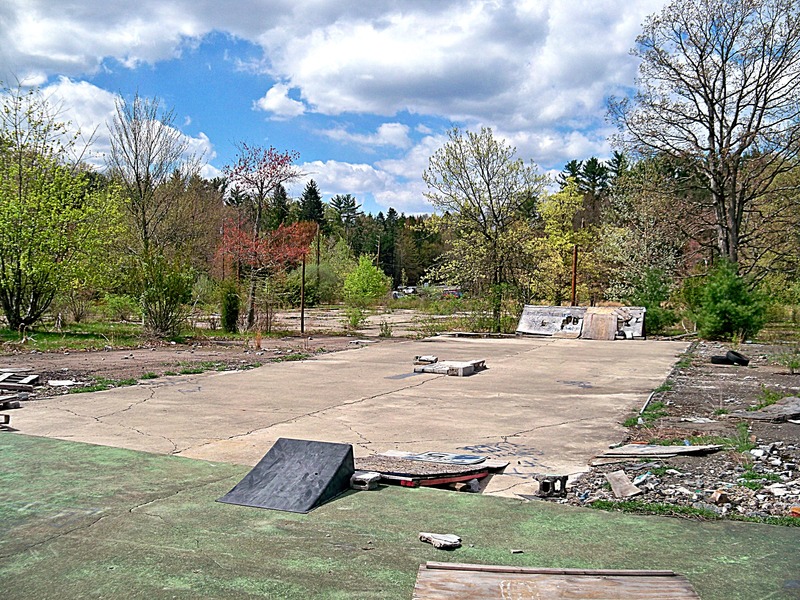 People still come to the ruins of Angela Park as evidenced by the makeshift skateboard park which they’ve built, like good little recyclers, by re-purposing the abandoned pieces of lumber and wide concrete pads where concessions, games or rides once stood. At least the things the last community left behind are being used by others to try to construct some sense of community for themselves. Somehow, abandoned places always take on a sometimes infinite number of second lives. Eastern State Penitentiary in Philadelphia, an abandoned jail turned museum, has an artist installation paying homage to this concept called The Ghost Cats which represents a testimony to survival as it calls attention to the lives of a colony of cats that took over the building for 28 years after it was abandoned as a jail in 1971. Recorded accounts of Angela Park’s first attempt at second life, during the 1990’s and into the early part of the new millennium, are portrayed as a Twilight Zone-esque creepy-carnival-nightmare-come-true with descriptions of graffiti covered buildings where local “Goths” would hang out and frighten the local community with their drawings of six-pointed stars and drug references, potentially holding astral-crossing seances—whatever that means! This was also the time of national panic about school children who dressed in black like the “The Trench Coat Mafia” at Columbine High School, with communities full of the kind of fear-mongering that led to the sort of witch hunt that resulted in the hasty conviction and imprisonment of the now free West Memphis Three. But that was also a different era in our recent history, before the proliferation of Ritalin, before schools were required to offer Emotional Support in the classroom and before bands like Green Day articulated the newly evolving teenage angst of millions of Jesus of Suburbia -types living in their soul-sucking cul-de-sacs across the nation. This was the time prior to the national frenzy of worshiping the tragically cursed souls of vampire boys who sparkle, before the culture of the undead became fashionable, and before “Goth” became a label for kids who were usually intellectual in nature and prone to artistic divergences outside of mainstream culture. It was during this era that Angela Park became a local monument to vandalism and indifference, full of “Big City” type graffiti—which was scary to small town minds because they didn’t know what it all meant. This was prior to graffiti becoming recognized as a legitimate form of art with museums and art galleries featuring graffiti exhibits and Paloma Picasso designing her graffiti inspired jewelry for Tiffany & Co. According to reports prior to demolition, the arcade at Angela Park was supposedly the most graffiti covered structure of all, a fitting and cool tribute for an abandoned arcade. Those hometown graffiti artists deserve applause for a job well done. Given the lack of understanding by the community at that time about the kids who hung out at the discarded park, and the fact that all good things must eventually come to an end, the remaining structures at Angela Park were razed. Sadly, a new, more organized purpose has yet to be realized on the property. In a perfect world, I’d like to think that communities have the insight and resources to listen to what abandoned locations are telling them about potential uses for the future. In the case of Angela Park, the obvious answer would be to turn it into a legitimate skate park. But since the prohibitive cost of insurance was a major contributing factor to the decline of the amusement park, it is unlikely that a skate park could ever be realized at the location due to the high cost of liability. It would be wonderful if someone would redevelop the location as another community-centric space with a progressive twist such as a simple public graffiti park. It would be easy to plant some flowers, put up some benches and build a huge wall for the purpose of allowing local graffiti artists to showcase their craft. Graffiti happens, usually in inconvenient places. Why not create legitimate places for it? It could become a constantly changing art exhibit for the community, by the community, and the wall could be repainted or cleaned off at regular intervals (like the graffiti wall in front of Graceland) so that there is always room for more artwork on a regular basis. Just like history, art can also be a verb and has the power to bring communities together. In this current era of America’s post-industrial decline, communities are left with too many abandoned places, few resources for development and a complete lack of imagination when it comes to ideas for new uses for these spaces. But whatever happens to the site of Angela Park in the future, the property, just like the community surrounding it, will constantly continue to change. As it stands now, Angela Park’s once proud Olympic size swimming pool holds trees instead of water, and the parking lot is well on its way to being eventually swallowed by the plants that have forced their way through cracks in the concrete. When humans fail to act, Mother Nature always reclaims her ground with the help of Father Time as he wears away the structural integrity of the objects that people leave behind. Angela Park opened during the summer of 1957 on Route 309 in Butler Township, just north of Hazleton, Pennsylvania. The amusement park started with only six rides which included a junior style wooden roller coaster built by the Philadelphia Toboggan Company. Throughout the years, a Paratrooper, Swinging Ship, Carousel, Spiral Slide, Scrambler, Ferris Wheel, Antique Cars, Tilt-A-Whirl, The Giant Slide, The Sky Ride, Tea Cups, an assortment of Kiddie Rides, The Swingin’ Gym, four refreshment stands, Porky the Paper Eater (an interactive pig-shaped trash receptacle that vacuumed paper through his mouth and told kids not to litter), several souvenir stands, a stage, an arcade, athletic fields, miniature golf, picnic facilities, and an Olympic size pool with changing facilities, lounge chair and diving boards helped the park earn the title the “Playground of Northeastern Pennsylvania”. In 1985 the Barletta Family (the park was named after family matriarch Angela) sold the park to the Mirth Master Corporation, based in Downington, because the younger members of the family were not interested in operating the park. Less than three years later, Mirth Master filed for bankruptcy. The park closed after the 1988 season. Several attempts to reopen the park failed. One attempt was led by Dr. Robert Childs of Hazleton, who hoped the park could continue as a nonprofit organization. Sadly, the park was put on the auction block in March of 1990 and the rides were auctioned off. The structures at the park fell into disrepair and were vandalized after the park closed. The location was used for several years in the late 1990s as a training facility for the Lackawanna Junior College Police Training program. In 2004, all remaining structures were demolished. All that remains at the location today are a few concrete footers, crumbling pavement, and a swimming pool filled with dirt and plant life. According to Wikipedia, the land is currently owned by New Land Development of Lackawanna County. Fishing is permitted on the property by courtesy of the landowner. A bit of history that I remember very well! We always had our family reunions there, and there was something, literally, for everyone… cool picnic grounds for theolder people, kiddie rides, a pool, a golf course, my favorite Scrambler and Tilt-a-Whirl and all of thsose rides my sons loved.I have some family pics taken at the park in the seventies and early eighties, and if I can find them, I’ll post them. I do remember that when we made reservations, we were always given a sticker to wear that said, “Picnic Is Fun” Not, “Picnics are Fun” or “To Picnic Is Fun”. Just “Picnic Is Fun”! Thanks for this lovely blog. And you’re right…we each remeber it in our own way. The description of the fuss made over The Wizard of Oz being played every year (Willi Wonka, too, though that one freaked me out… I prefer to remember the nights The Great Pumpkin came on), as well as the rides at Angela Park, really takes me back. I grew up in north Louisiana, and just as you said, there was a small local amusement park called Hamells, which had many of the same rides. I looked it up recently, since I’ve lived in California for years, and it’s closed too, after a tornado folded the ferris wheel in half and damaged other rides. When it was open, because of its smallness it stood somewhat in the distant shadow of Six Flags over Texas (I think it was called that, maybe it was the only Six Flags around at the time?) but it was still a big deal to go to the yearly hospital picnics and ride all day on the rides with just a hand stamp. My bro & I used to take extra napkins from the concession stand for Porky. 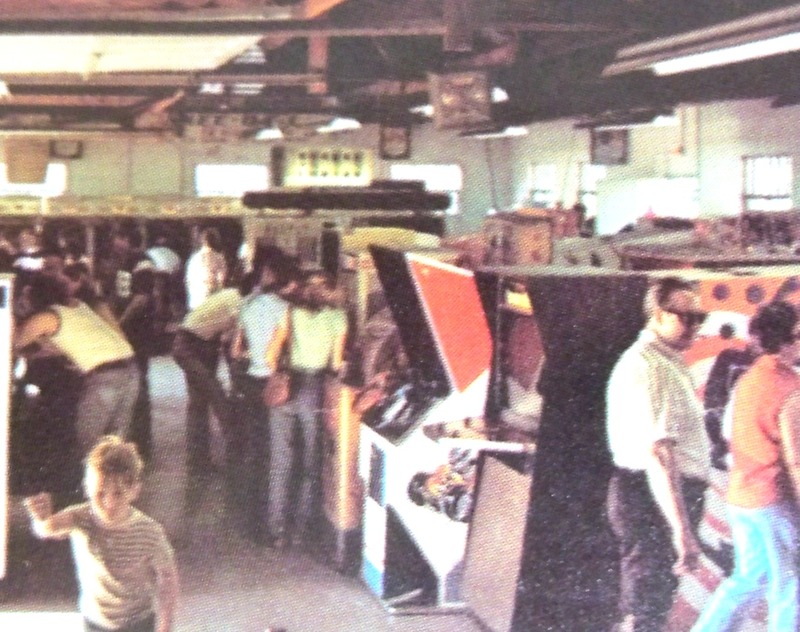 The first time I kissed a girl was behind the arcade. Thank you for calling attention to the sad condition of one of Luzerne County’s treasures. I wonder. Will they re-build angela park in nearest future? I had lot of greatest memories at Angela Park. I attended there from 70’s to 80’s. I’m 40 now and I remember my visits to Angela Park like it was yesterday. Thanks for this blog! Great blog! I grew up in Wilkes-Barre and remember going here as a kid with my grandparents, parents and brother and sister in the 1970’s & 80’s. Great times and good memories. I’m glad PA still has a gem of an amusement park in Knoble’s Grove. I had a dream one night that Angela Park reopened. Except they put the roller coaster where the bumper cars were. It was a kinda freaky dream. I am from Pennsylvania. I find your images simultaneously beautiful and haunting. Wow is all I can say! Loving this website , you have done a great job. Miss these happy places from the past. That is one park that i will always remember. My father use to work for Shultz Recapping and they had there company picnic there yearly. Fun times, good food, and great rides. May she R.I.P. We had our Swoyersville grade school class trips to the park each June. I fondly remember paying $2.00 for a sticker to ride all the rides for all day. I rarely leave responses, however Angela Park was the amusement park of my childhood memories! Thank you for reminding me of the fun I had at the arcade and riding the roller coaster. A sense of vulnerability and shared humanity! Beautiful, my friend! We are all connected to everyone and everything at all times. We are not isolated or separate. We are literally not the same person we were a minute ago, let alone a day, a month or a year ago. Keep writing! Hello there! This post could not be written any better! Thank you for sharing! I know I’ve told you this before, but I absolutely LOVE your writing ~ it’s so descriptive and takes my imagination right to the scene your are painting with your words. I don’t think I’ve ever had the pleasure of visiting Angela Park (I will have to check with my parents to confirm) but the way you described the rides, and the noise of the coasters, the smell of the cotton candy & french fries ~ I could close my eyes and put myself right there!! Thank you, once again, for a brilliantly written piece! !